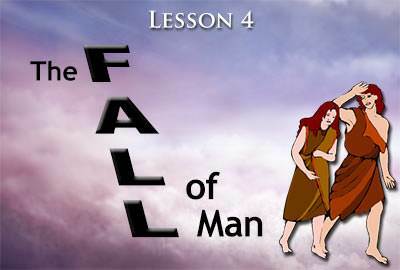 In Lesson 2 we learned that Adam was created in the image of God. As he came forth from the hand of his Creator, Adam was sinless. His nature was pure. He did not even have a tendency to sin. 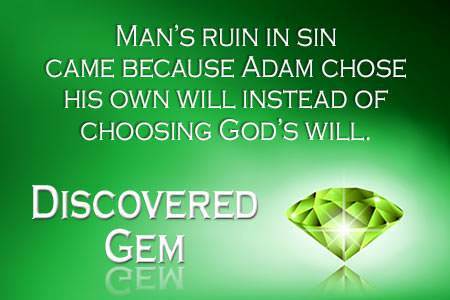 However, it was possible for Adam to sin because he had a free will. He was free to choose to obey God or to disobey Him. God knew that Adam needed a wife, so He caused a deep sleep to come up on Adam. While he slept, God took a rib from Adam's side and with it formed a wife for him. Adam named her Eve, which means "mother of all living." God placed them in a beautiful garden called "the Garden of Eden." It was Adam's duty to care for the garden. 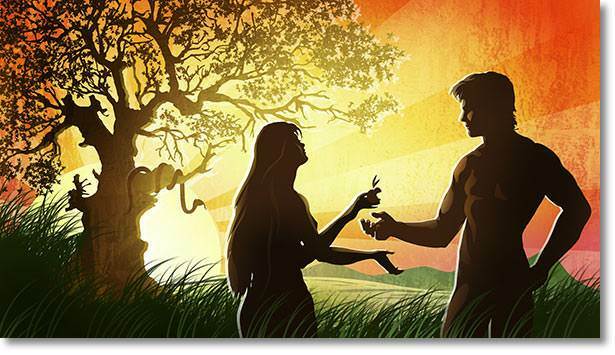 Adam and Eve were happy in the Garden of Eden and perhaps lived this way for some time. One thing that they especially enjoyed was the wonderful fellowship they had with God, their Creator. In the cool of the evening, God would come and visit with them. But one day, a terrible thing happened! This seemed to be a harmless question but Satan had an evil plan. His plan was to deceive Eve into disobeying God. Not only did Satan contradict God, but he also suggested that God was holding back something good from Adam and Eve. Satan told Eve that, by eating this fruit, she and her husband would be as gods. Eve had to make a decision. God had said, "You will surely die." Satan now said, "You will not surely die." Eve had to choose whom she would believe—God or Satan. Eve looked at the fruit and thought about what Satan had said. Then she made her choice. She took the fruit and ate it. Eve chose to believe Satan! Satan's plan to deceive Eve had been successful. She actually believed Satan! She was deceived into believing a lie. 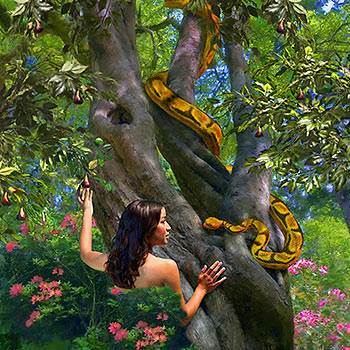 Why was Eve deceived? Because she did not believe God's word. We too will be deceived if we do not believe what God has said. But this was not the end of Satan's evil plan. Satan also planned to cause Adam to sin. This time, however, Satan did not speak directly to Adam. Instead, he depended on Eve to cause Adam to disobey God. Eve offered the fruit to her husband. No doubt she told him what the serpent had said about the great power to be bestowed upon them by eating the fruit. Now, Adam had to make a choice. He knew what God had said. God had plainly told him that the result of eating the fruit would be death—not power. 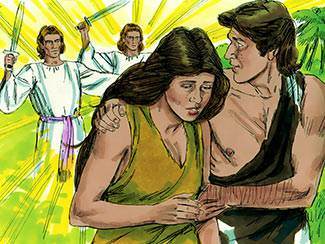 Was Adam deceived by what Satan had told Eve? No, he was not. He knew better. Nevertheless, he took the fruit and ate it. Adam had sinned! What was Adam's sin? His sin was disobedience. He disobeyed a direct command of God. He chose his own will instead of choosing God's will. In so doing, Adam rebelled against his Creator and followed Satan, the first great rebel. 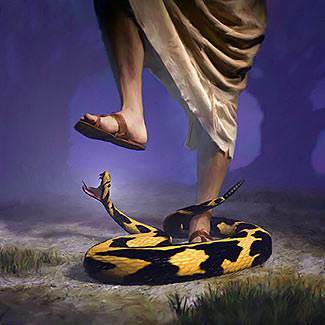 The immediate result of Adam's disobedience was death! But what kind of death was it? It was spiritual death. We know that Adam's body did not die at once. He lived for hundreds of years after his act of disobedience, but he died spiritually that very day. In the Bible, death always means separation. We all know what physical death is. It is the separation of the spirit from the body. But what is spiritual death? Spiritual death is the separation of God's Spirit from man's spirit. 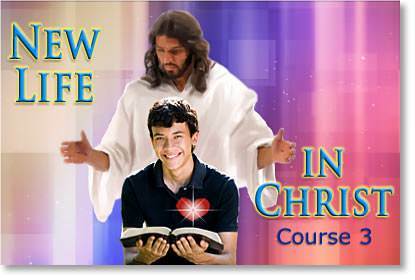 To be cut off from the life of God is to be dead spiritually. This is what happened to Adam and Eve when they sinned against God. Their spirits were cut off from God's Spirit. They died spiritually. 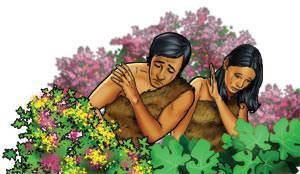 Why had Adam and Eve not needed clothing before? Because they had been clothed with the light of God's glory. Now that sin had entered their lives, they were separated from God, and God's glory had left them. Adam and Eve were sinners! 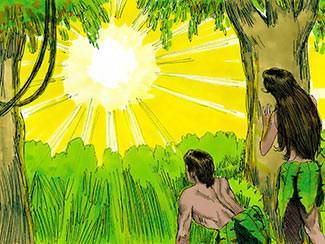 That same day, in the cool of the evening, God came seeking Adam and Eve, but they no longer wanted to see God. Instead, they felt guilty and hid themselves among the trees of the garden. But no one can really hide from God. A righteous God could not overlook their sin. He could not pretend that nothing had happened. God called Adam and Eve to come to Him. Then He pronounced His judgment upon them. They would have to leave the beautiful Garden of Eden. Hereafter, Adam would have to work hard to get his food from the ground. Eve would be subject to her husband and would bear children in sorrow and in pain. Even the ground itself would be cursed because of their sin. God's first man, Adam, had been defeated by Satan. 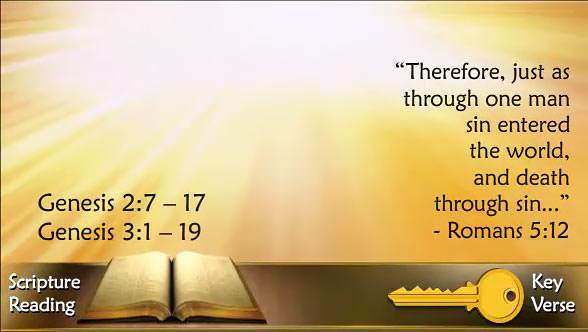 Here God gives the promise of the coming of the Lord Jesus Christ, who would defeat Satan. 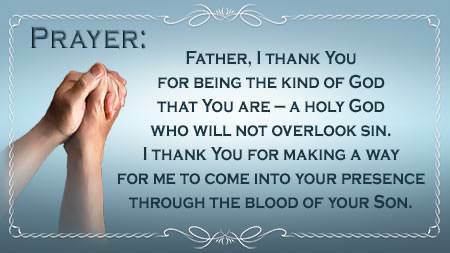 Because God is a holy God, He cannot allow sin in His presence. 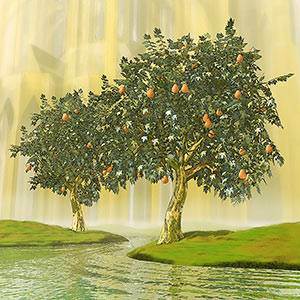 Adam and Eve had sinned; therefore, they had to leave the Garden of Eden. Sin always separates man from God. But God had a plan. One day He would send His only begotten Son into the world to die for man's sin. By His death on the cross, the Lord Jesus would make it possible for man to be forgiven of his sin and to come back into fellowship with God. God had provided the way for Adam and Eve and their descendants to come back into fellowship with Him. From that time until Jesus would come as the Saviour, people were to offer innocent lambs as a sacrifice for sins. God accepted these animal sacrifices because those who offered them were looking forward by faith to the coming of the Lord Jesus Christ. Adam had two sons whose names were Cain and Abel. They had been taught the true way in which to worship God. 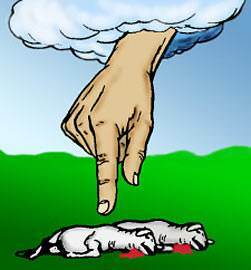 They knew God's requirement of offering innocent lambs as a sacrifice for their sins. Both sons brought their offerings to the Lord. Cain brought the fruit of the ground for his offering, for he was a farmer. But God rejected his offering. Abel tended sheep. He brought a lamb as his offering and God accepted his offering. It is important to know why God accepted Abel's offering but rejected Cain's offering. It was not because Abel lived a better life than Cain. Both Cain and Abel were sinners. God accepted Abel's offering because he offered a lamb which was a type of Christ, the Lamb of God. 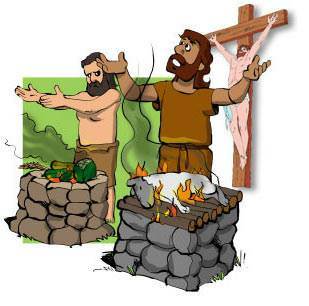 Abel confessed that he was a sinner and brought a lamb as an offering for his sins. By faith Abel was looking forward to the coming of God's Son who would die for the sins of the world. God did not accept Cain's offering because he came in his own way instead of God's way. Cain thought that forgiveness of sins could be won by his own efforts. Since the time of Cain and Abel, there have always been those who have come to God as sinners trusting in the Lord Jesus Christ and those who have tried to come to God in their own way. But God has not and never will accept anyone outside of Christ. We can say that all false worship began with Cain.